HONDIUS - Descriptio fluminum Rheni, Vahalis et Mosae. HONDIUS, H. - Descriptio fluminum Rheni, Vahalis et Mosae. Descriptio fluminum Rheni, Vahalis et Mosae. - HONDIUS, H.
Title : Descriptio fluminum Rheni, Vahalis et Mosae.. Size : 14.8 x 19.5 inches. / 37.5 x 49.6 cm. 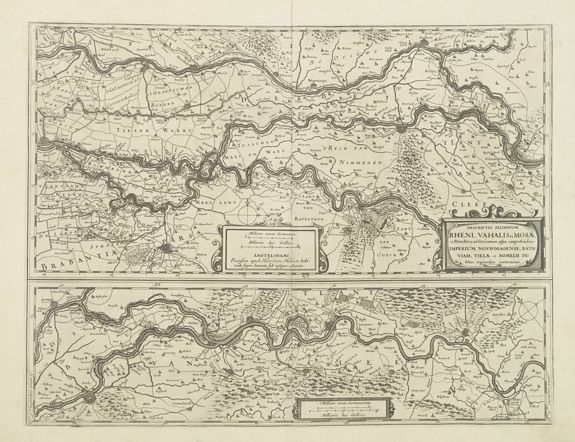 Description :Extremely rare edition of this fine map in central Netherlands where the three great rivers flow to within but a few kilometers of each below Wesel. The scale allows most of the larger towns to be depicted by miniature plans showing the fortifications. From the rare atlas Appendix, published in a very small numbers, before several of the copperplates sold to Willem Blaeu. Koeman's Atlantes Neerlandici, New Edition, Volume 1, 3705:1.1. Condition : A good and strong impression. No text on verso.